The Stars of College Tennis are Coming to Malibu, September 20-23, 2018, Will You Be There? 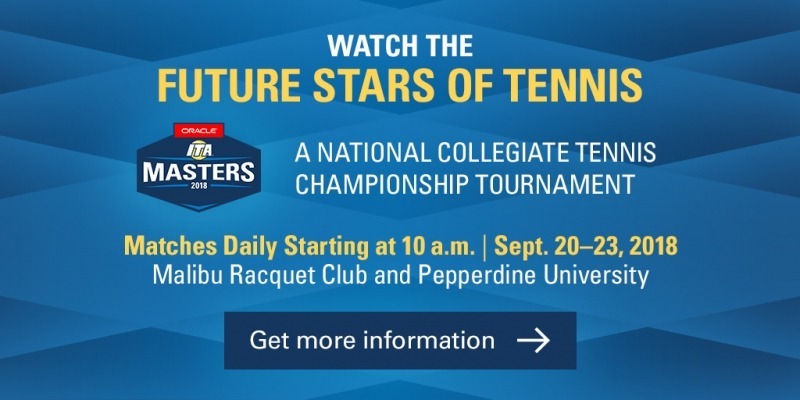 Join us at Malibu Racquet Club and Pepperdine University to watch the current stars of college tennis. The Oracle ITA Masters will be held September 20 – 23, 2018, a family friendly event that is FREE to attend! This national tournament features the rising stars of tennis – 32 of the top men’s and women’s singles players in the United States. These elite college tennis players will face off in singles and pair up in mixed doubles over the course of the weekend. The player field has just been announced! On September 21, come enjoy ‘Friday Night Live’ – tennis matches and live music from 6-9pm. Food and drink available. Illini Aleks Kovacevic will be playing in the tournament so come out and cheer him on. We look forward to seeing you there – on your own or with a group of family, friends or colleagues.